Ukraine International Airlines has begun a long-awaited goal of serving as an airborne link between Canada and Ukraine. Wednesday (June 6) saw the airline begin non-stop Toronto-Kiev service, with the Monday, Wednesday and Saturday flights using B767-300ER aircraft with three classes of service. The airline marked the launch by offering fares starting at $875 for travel to Kiev and $880 for travel to Lviv and Odessa between Oct. 17 and Dec. 15 and Jan. 16 to March 30. 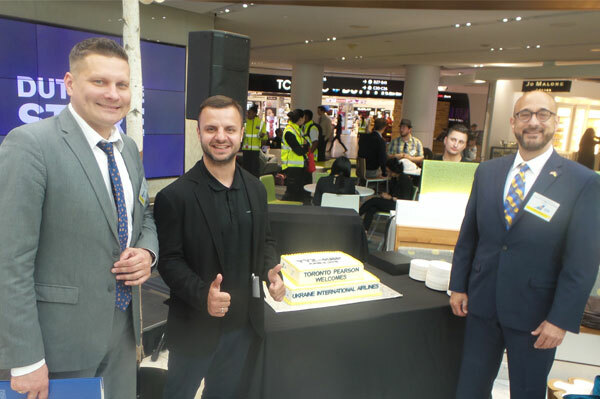 Ukraine International Airlines president Yuri Miroshnikov told a gathering at Toronto’s Pearson International Airport that he promised direct Toronto-Kiev flights in 2016 and held out the possibility of increased service between the cities. “I’m pretty sure this is only the beginning,” he said, adding passengers will find “excellent connections” in both the Ontario and Ukrainian capitals. Howard Eng, president of the Greater Toronto Airports Authority, said Pearson is expected to see major growth in traffic in the coming years. Eng also said he expects the new service will lead to more business, tourism and cultural exchanges between Canada and Ukraine. Meanwhile, GreGG Truman of Ukraine International Airlines’ New York office said he’s completely confident that Ukraine is a safe destination for tourists. The country has at times made news in the past couple of years because of periodic clashes between Ukrainian troops and pro-Russian forces. The area of Ukraine where pro-Russian forces may still be found is so small that it’s “physically a non-factor” and that area is sealed off, with neither tourists nor Ukrainians able to enter it, he said. Pictured are Andrii Pavlenko, UIA’s director of sales for Europe and North America, Anton Taranenko, head of the Kiev City State Administration’s tourism department and Truman.